A special investigator looking at the human rights situation in Myanmar warns the minority Rohingya Muslims in that country face an uncertain future as do hundreds of thousands of Rohingya refugees who fled to Cox's Bazar, Bangladesh due to violence. The investigator's report is under review by the U.N. Human Rights Council in Geneva. 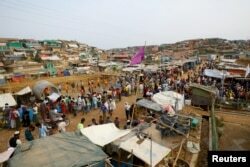 Nearly one million Rohingya refugees are living in cramped, squalid conditions in Cox's Bazar, Bangladesh. Most headed there in August 2017 to escape violence and persecution in Myanmar. Special investigator Yanghee Lee says their welcome is wearing thin and the situation in Myanmar remains too dangerous for them to return to their homes of origin. Lee said conditions in Myanmar itself have not improved for the Rohingya who remain in Rakhine state. She says she is deeply concerned about their future as well as for the future of those who fled to Bangladesh and other lands. "I am becoming fearful of an increasingly internationalized situation of the Rohingya, with deportations from India and Saudi Arabia recently, as well as a boat arrival in Malaysia just last week," she said. "The boat arrival is particularly worrying; it illustrates the desperate situation of the people who decided to take the perilous journey, and harks back to the boat crisis of 2015, which must not be repeated." That refers to the thousands of Rohingya who set off in fear of their lives from the Bay of Bengal in 2015 in boats that were not seaworthy. Many became stranded at sea and died. Lee said she also is troubled by a proposed plan by Bangladeshi authorities to relocate 23,000 Rohingya refugees from camps in Cox's Bazar to an island in the Bay of Bengal, which she fears may not be truly habitable. The U.N. investigator also accuses Myanmar's high-ranking military and ex-military officials of making vast profits by plundering the country's natural resources and devastating the state's forests by selling timber on the international market for huge sums. "Revenues from natural resource extraction are needed for vital services and development being diverted to the military and its allies undermines the civilian government, democratic reforms, the peace process, sustainable development and the realization of rights," she said. Myanmar's ambassador to the U.N. in Geneva, Kyaw Moe Tun, called Yanghee Lee's report biased. He accused her of not complying with the appropriate code of conduct and said Myanmar will discontinue cooperation with her. He said his country has embarked on economic and human rights reforms. He added that the repatriation of Rohingya refugees should begin expeditiously, noting that all returns would happen in a safe and dignified manner.